Bukhara possesses a singular allure. Over 2,500 years old, it was one of the most important trading centres of the Silk Road. During the golden age of the Saminid rulers, Bukhara also became the intellectual centre of the Islamic world. The entire old city is now a UNESCO World Heritage site: it is the most complete example of a medieval city in Central Asia, with an historic ambience and an urban fabric that has remained largely intact. It is so easy to spend hours exploring the ancient caravanserais and madrassahs, now housing artisans workshops, antiquarians, fabric boutiques and knife makers. The old Jewish quarter, the residential neighbourhoods set along cobbled streets, all make for marvellous strolls. And for those travellers interested in avant-garde and 20th century art, Bukhara's small Contemporary Art Museum is a *must-see*. Located between the first and second trade domes, it is housed in a corner, brick building constructed in 1912 as Central Asia's first central bank. Despite a fine collection of Soviet artists, such as Pavel Benkov, Mikhail Kurzin, Alexander Volkov, Nadeja Kashina, the exhibition space dedicated to that period is not easy to find. Entrance to the museum is at street level and is about US$2. There is usually an exhibition of local painters' works on that level. Ask the staff at the ticket office where the avant garde art is and someone will lead you through several rooms, then up stairs at the back until you reach the modernist section. Pavel Benkov came to Bukhara in 1928 and it was a turning point in the artist's life. Benkov's portraits on display reflect his skill at capturing the essence of Bukharan life at the time. 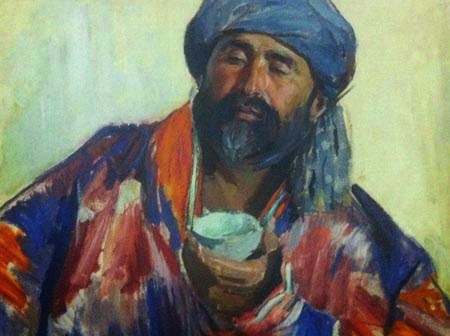 In Tajik with a Tea Bowl he has brilliantly captured a proud man, fully conscious of his own dignity. The museum's collection of Benkov's work is significant, ranging from portraits to cityscapes. 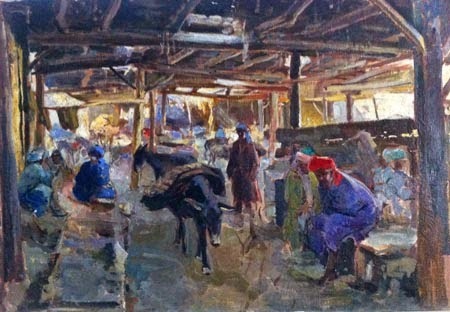 Mikhail Kurzin lived and worked in Bukhara in the late 1940s. 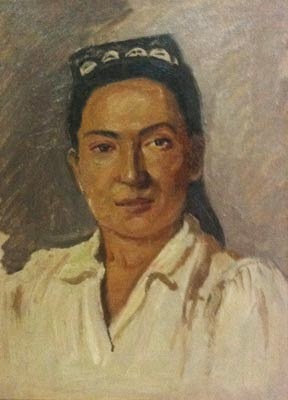 (Kurzin was the founder of a Tashkent art group Masters of the New Orient). He was later repressed and sentenced to 5 years imprisonment and 3 years exile. On his release he moved to Bukhara until 1948 when he was exiled once again. Kurzin painted a series of portraits of well-known Bukharan artisans - engravers, weavers, stone masons, metal chasers, embroiderers and jewellers - all painted in bold, broad strokes. 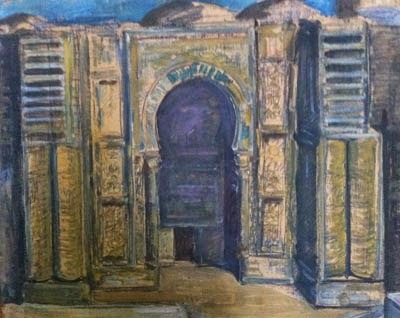 There was a shortage of materials in the post-war years and Kurzin sometimes simply painted on cardboard. The museum is open daily from 1000 - 1800 daily and closed on Tuesdays. Overlook the rather sad exhibition space and tilted hangings. If you speak Russian, try to arrange a guided tour with one of the art historians there. Call in advance: +998 65 224 5853. Stopping by this collection is an excellent prelude to the Savitsky museum in Nukus, visited on an Uzbek Journeys tour.